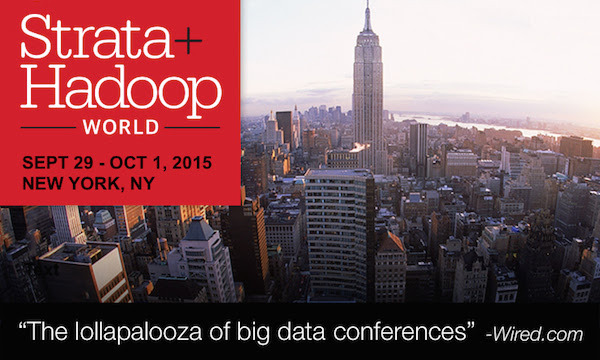 Strata + Hadoop World 2015 is in just three weeks, September 29-October 1 in New York. If you haven’t made your plans yet, don’t wait much longer—it sold out two weeks before the event last year with 5,500 attendees, and is only expected to get bigger this year. New Keynotes—David Boyle, Katherine Milkman, Jeff Jonas, and Maciej Ceglowski (to name just a few). Industry sessions—financial services, health, music, social good: if you're in any of these industries, don't miss these sessions. Cultivate Conference—learn how to lead through culture and transform your business, at Cultivate (Sept 28-29), co-located with Strata + Hadoop World. No wonder our attendees say: "I learned more about big data in just three days attending Strata + Hadoop World than in one year doing research on my own." Make your plans today before it sells out again.